Where are we going today? How far is it? Both common questions in our family. Today we are going to church. 1 bus and 1 train 5 MTR stops end of the line for the bus. 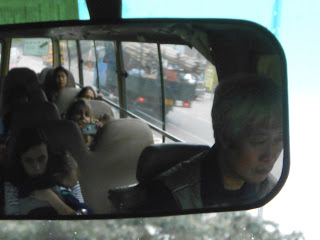 No we are not going in the ocean or under the harbor and we are taking a mini bus which is much faster than a double decker because they only stop when signaled and not at all if they are full. Which they usually are with the 6 of us. There are drivers we are getting to know a little. One sings in Cantonese, one drives a bus you pray will not breakdown, one rockets around curves like a rollercoaster and his load is always green at the end, today we have a whistling driver. Jp has been squeaking ever since.